I first became aware of this word in College. No, I was not studying the English language; I was watching a W.C Fields movie. In the movie, some character comes into Field’s place and W.C. states, “None of your peccadilloes in here!”. W.C. Fields had an amazing command of our language. His was a unique blend of vaudevillian slapstick and cerebral humor. A peccadillo is defined as a “trifling sin”. The kind of thing someone does that may annoy if you do not like them much but would embrace and tolerate with a loved one. 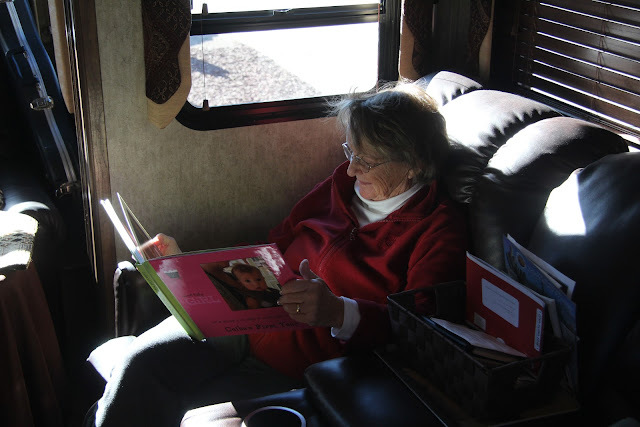 Here’s a pic of my travel pal, enjoying a photo book she made of and for a granddaughter. She’s cute, huh? Sitting in one of her favorite spots in the RV. She is a good friend and forgives me my many peccadilloes. One of the many reasons I love this gal.